Home / Sights, Scenes And Writs / Chimamanda Adichie’s ‘Americanah’ Now on OkadaBooks! 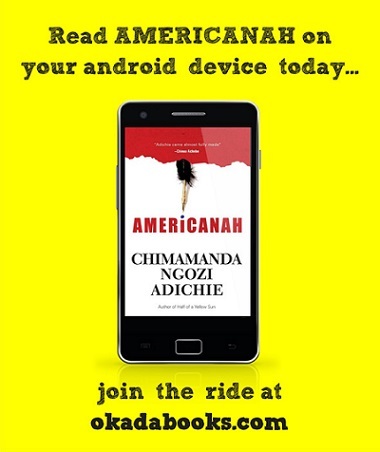 Chimamanda Adichie’s ‘Americanah’ Now on OkadaBooks! The critically-acclaimed novel, Americanah, by Chimamanda Adichie, is the story of love and race centered on a young man and woman from Nigeria who face difficult choices and challenges in the countries they come to call home. You can now get the book from the Okadabooks app. Download this app now for your mobile android device today at Play Store. The app also provides the readership of other books you may like. And for those writers who have unpublished manuscripts that they would like to have published, simply drop word on the email address, okada@okadabooks.com, to make it happen. But there’s nothing like a hard copy.